US President George Bush has said it is "absolutely possible and necessary" for Israel and the Palestinians to agree a peace deal during his term in office. 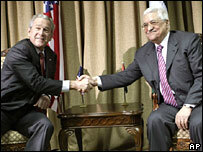 Mr Bush was speaking after holding talks with Palestinian leader Mahmoud Abbas in the West Bank. Mr Bush also said Israel must "help and not hinder" efforts to create credible Palestinian security forces. Mr Bush is meeting Israeli and Palestinian leaders as part of efforts to push a US-sponsored peace process. It is his first trip to Israel and the West Bank since taking office in 2001. He is trying to use the visit to push forward stalling Israeli-Palestinian peace talks which were relaunched last November. A huge and complex security operation is under way to protect Mr Bush, who, following the talks, flew to Bethlehem, where he visited the Church of the Nativity. Speaking after about 90 minutes of talks with the Palestinian president, which followed a meeting with the Israeli prime minister on Wednesday, Mr Bush said he was sure both men "understand the importance of two states living side by side in peace". "And I believe it possible - not only possible, I believe it's going to happen - that there will be a signed peace treaty by the time I leave office" in a year's time. To do so, he added, both sides would have to honour their commitments under the so-called "road map" to peace. The process would be monitored by Lt Gen William Fraser, an assistant to the chairman of the US Joint Chiefs of Staff, US officials said. Mr Bush said Israel should not harm the process by undermining the effectiveness of the Palestinian security forces. But, asked why he would not hold Israel to the many United Nations resolutions critical of its presence in occupied territory, Mr Bush said the choice was whether to remain stuck in the past, or to move on. He said Palestinians had to decide whether they wanted "a state, or the status quo" - one vision represented by Mr Abbas's Fatah movement, the other by rival Palestinian group Hamas, who he said had "created chaos". Pressed on the problems posed for Palestinians by ubiquitous Israeli checkpoints, he said he understood their frustrations but said they gave Israelis a "sense of security". For his part, Mr Abbas welcomed Mr Bush's "commitment to the peace process", which he said the Palestinian people would not forget. He said he wanted "a different future" for the Palestinians instead of the present reality of "hospitals full of innocent victims", checkpoints, and "humiliation under siege". He said the two sides had begun discussions on the core issues that divide them, and said he wanted a resolution before the end of the year. "Peace in the world starts from here, the sacred land," he said. 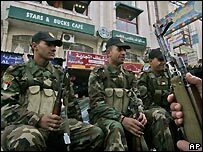 Snipers and thousands of other Palestinian and US security agents have flooded the West Bank in a huge operation to safeguard the president's security. Mr Bush is an unpopular figure among Palestinians who view him as being overwhelmingly pro-Israeli. Earlier, Palestinian security forces used tear gas and batons to break up a small demonstration against his visit in Ramallah. Mr Bush arrived in Israel on Wednesday to a lavish welcome ceremony, at which he described Israel as the US's "strongest and most trusted ally".